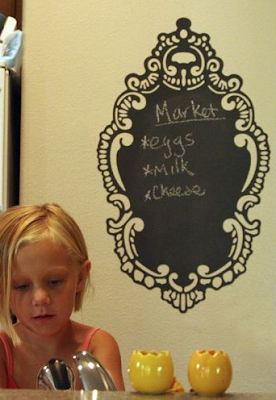 Have you ever seen this insanely cute chalkboard wall decal? Well, it can be yours, compliments of all modern! All modern is a great website that has contemporary furniture and modern bedding! and leave a comment about your favorite thing on my blog! cross your fingers and hope to win! I love these chalkboard cuties! And I adore everything in All Modern - especially the feather beds! 3. My Fave Thing...sorry, can't pick one because I love it all! That is SOOOO cute! It would look great in my entry! Thanks for the chance to win! Love your blog and music too. Usually not a fan of music on blogs but yours is just the kind I like! What a greta giveaway! That's taking black boards to a whole new level. Cute! I am a follower and I love your post called "feeling blue." I am all about serene blues & whites and the styles pictures are totally me. Thanks for the lovely eye candy you share in all of your posts. Such an inspiration! I think that would look great on my fridge! And, I found the lights in want in my hallway at CSN Lighting. I'm a follower and would love to be entered in your give-away. Love the chalkboard! My favorite thing on your blog right now is your family room makeover! Love the IKEA sofa. I am ordering the same one in white! I love it! I would love to win that for our kitchen. Is this giveaway open to Canadians too? A decal!? That's cool! I'm a relatively new follower, but my favorite thing is all the pictures. I loove looking at all the pictures! Great inspiration for me! Loving the blue draper stripe duvet cover collection on the site ~ some of the light fixtures are really cool too! I follow your blog. I loved your Sept. 25th posting about "fun with white pumpkins". Loved the pics! I did check out all the links! Thanks for the giveaway. Would absolutely LOVE to win the chalkboard!! So cute - I love your home and any time you show pictures of your home! I'm a DIY kind of girl. I am a follower, I looked at the links and I must tell you, I read your blog everyday...love it, but if I had to pick one thing, I love the recipes you share...especially the Pumpkin Enchilada one you shared this past summer....I just made it and it was sooo good! Thank you!!! I'm a follower and I love All Modern!! Thanks for the great giveaway!! I'm already a follower and I loved the links you share. As many others It is so hard to pick just one thing I love about your blog. I think for me your style is it. I follow your blog religously. My favorite thing - that's a hard one. I guess it would be all the gorgeous photos you post. They are so inspirational that sometimes i print them off so I can duplicate something in the photo. Could that blackboard be any cuter? Love your daily posts...I always look forward to them! Oh I love that chalkboard! I checked out the site, and I have to say the "Do frame" tape is pretty cool! I have never seen that before! Finally became a follower, although I've "followed" your blog for a long time. Never knew about allmodern, so it was cool to check out their website. My favorite part of your blog has always been your rate my space section. Love the chalkboard! Just used chalkboard paint to cover an ugly painting of mine with a gorgeous frame, now I love it! I just love everything about your blog. I get great ideas and inspiration! Your blog was the first blog I followed and still one of my favorites. As a mom of 2 toddlers and owner of a 125 year old DIY remodeling project, I love that I can get on your blog and completely be inspired by your style. My favorite thing about your blog is the flow of your amazing pictures and the fact that you combine all the best decor photos out there on one blog. No need to look any further :) I am totally inspired to take on a new room after I view your blog (THANKS!). I love the chalkboard! and i also love all of all modern's bedding- the coffee and blue coverlet is my fav! I loved when your hubby was out of town and you painted on whole wall in your kitchen with chalk board paint! And he loved it! As did I! I am already a blog-stalker. Seriously...you are the first one I go to every morning and the last one I read at night. I even took a peek tonight after being at a flea market selling my wares all day! And I've been up since 3:30 am! If that is not stalker-of-your-blog behavior, I don't know what is! ;o) Honestly, you are full of energy, busting with ideas and you get it done with what looks like such ease. Now, that is INSPIRATION. That is what I love about your blog! I love that! My favorite thing about your blog are the pictures and how-to's of the projects you do at your own home~Like I have said before, you are a huge inspiration!! First, I love love love that chalkboard...its SO adorable! I checked out CSN and I really like the lighting they have. I also like the modern site as well...really pretty duvets. I really like how simple you make all the how-to's on your site look...like I can really do it! Too cute...loving this! I'm all in. :) Thanks for doing this giveaway. I am already a happy follower, lol...and I visited the last link. My favorite thing RECENTLY about your blog was that creative photo of the "I love you" sign. And overall, I always like how peaceful your blog feels here. My favorite thing was the lighting...I may have just found a light for my friend on there! I love your blog and that everything you do is something that I can do too! You have great taste and help others make their homes just as great as yours. I also love, love, love the new family room! Love the bedding on the second listing. Really beautiful stuff. I love this giveaway! I am already a follower, and my favorite thing is seeing your DIY posts, they are inspiring! Love the children's bedding in the 2nd link. the decal is fabulous - I follow your blog every day... favorite item... picture and ideas... both daughters just bought 'needs tlc' first homes... so we need lost of inspiration! Favorite thing on site-the pics I love them! Very cool! Already a follower -- would you throw my name in the hat please?! Have a great week! I looked at the site and most was too modern for my taste but I did love the flower like lighting. Very cute for a kids room! these are such fun sites to cruise and shop from! I love adding some modern bits into a traditional home. Takes the pucker out of the sweetness that traditional homes can have! That chalkboard decal is too cute - but I am having a huge trouble trying to find just ONE thing that is my favorite!! Oh, I've been craving one of those! BTW~ I'm having a giveaway too. Stop by! Melaine I found you through rate my space and my life has changed....I never really knew what "blog" meant until then. Through "stalking" you everyday I have found so much more to do to make my life fun. I enjoy the whole blog world now and can't imagine my first cup of coffee in the morning without you! Oh and the chalk board decal...to DIE for! I love all the pillows on the bedding site. But now I'm thinking some new sconces for my bathroom would be great. Oh, pick me. I love that decal. Love the chalkboard. Would come in very handy in my future home. My favorite thing on your blog right now is the 'random thoughts from people our age' post. Too funny and too true! I'd love to win that chalk board decal. It is super cute. Love that! Great idea. I have to pick ONE thing about your blog?? Official follower as of now; which is REALLY weird b/c I've been following you for quite some time. Thanks for the eye candy on the other sites. Fave. thing about your blog....when you show us projects or decorating in your home!! That chalkboard is so cute! I hope I win!! My favorite is the Armless Chair in Gerber Surf. Gorgeous! I follow now - even though I just checked your blog regularly! Ans at All Modern - gotta love the throw pillows!! oops.. that was supposed to be *and*! so stinkin' adorable! i love it! and i love your blog too! Sweet chalkboard decal! I love your inspiration pictures ... absolutely gorgeous and very, very refreshing! Ok, lets try this again....I love that decal, I've seen it before somewhere and I've bookmarked the site this time so I can get on. LURVE it! You always post, that's what I like. Coming here and seeing new content. Keep up the good work. This is soooooo unique! I want one! you want to know my fav. thing on your blog? This is such a cool giveaway... I truely enjoy reading your blob everyday, and my favorite thing is looking at all of your home pictures that you showed on RMS... That is where I found you and I am so glad I did... Thanks for the Giveaway!!!! Love the pumpkin ideas! Stopping at the local farmer's market on the way home for some more pumkins. I follow, I checked the links, I love how you take one thing and find such beautiful pictures to go along with that theme. That decal is TO DIE FOR!! So you say we have to pick one thing we like about your blog - one thing??? I love the overall feel - just light & airy & inspiring. I have to say I'm loving those feather beds. i've followed you forever via google reader & officially am following now too! Have a great day!! I have followed the four steps...became a follower, checked out the sites (gotta get me some pillows) am telling you (now) that I have no favorites, love everything & have crossed my fingers (making typing difficult.) I am really hoping to win the oh-so-cute-&-i-know-just-where-it-will-go chalkboard. I saw your recent post "a breath of fresh air" post that Sherry from YHL shared on Google Reader. I absolutely love the pictures! I'd love to win that adorable decal! got drawn into searching page after page of those links? yes. adorable, yes I do follow you! I love this! And I love all of your inspiring photos and ideas!